No longer just my favorite condiment on a hot dog…now my favorite remedy for what happens OFTEN in my kitchen: BURNS! I had heard about this home remedy for years but could never seem to remember it when I actually needed it….until last night when I touched a pan I had forgotten had just come out of the oven! I immediately put my injured thumb under cold water and asked Jeff if he would get the mustard out of the fridge for me. Perplexed, he got it for me but seemed to be quite alarmed when I asked him to pour some on my burn. I shared my new “mustard healing tidbit” and with much doubt on his face, he kindly obliged. Within 5 minutes, the burning sensation was completely gone and this morning there is no blister or even a sign of my little mishap! 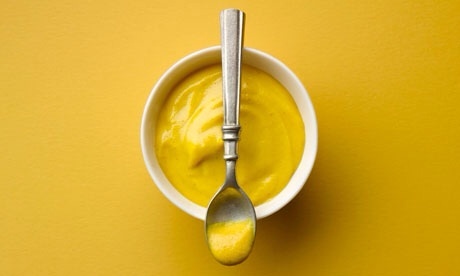 My love for mustard kindles in my heart but isn’t burning on my thumb! 🙂 Give this home remedy a try!